Spread across 18 acres of beautiful Moghul gardens, this heritage property dates back to 1745. Offering Indo-Saracenic architecture with Colonial-style interiors, it boasts an outdoor pool, spa and fitness facilities. 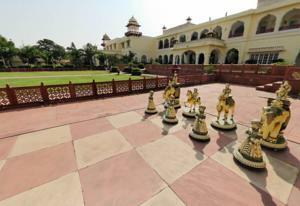 The 5-star Jai Mahal Palace offers a range of rooms featuring modern and classic Indian-style décor. Solid wooden flooring, a flat-screen TV and luxurious bathrooms with a bathtub are standard in all rooms. Jai Mahal is 7 km from attractions like City Palace and Hawa Mahal. Offering free parking, it is just 3 km from Jaipur Railway Station and 14 km from Jaipur International Airport. Guests can have a game of tennis on manicured lawns before heading for a relaxing spa massage. Concierge services and a business centre are available. The property offers 4 restaurants boasting a wide variety of Western, Asian and Rajasthani specialities. Leisurely afternoons can be spent with a refreshing cocktail at the Pool Lounge. Rooms: Hotel Rooms: 100, Hotel Chain: Taj Hotels & Resorts. Free! Up to two children under 12 years stay free of charge when using existing beds. One older child or adult is charged INR 1382 per night and person in an extra bed. Free! One child under 5 years stays free of charge in a child's cot/crib. Maximum capacity of extra beds/children's cots in a room is 1. Any type of extra bed or child's cot/crib is upon request and needs to be confirmed by the hotel. Supplements will not be calculated automatically in the total costs and have to be paid separately in the hotel.